The bland moniker might not inspire much confidence in the music but don’t let that mislead you. Infinita Symphonia’s brand of melodic/power metal is a highly poignant one that seeks to explore the emotional side of riffing without sacrificing power or momentum. It might sound cheesy, I know, and the band does hit some saccharine spots very often, but they achieve everything in such a manly way you’ll be shedding a man tear or two when all is said and done. Instrumentally, things are pretty tight. One can tell the guys are talented with their instruments but choose to hold back their skill to avoid sounding too technical or flowery, an indication they want the focus on emotionally affecting chorus arrangements and moving melodies than showmanship alone. The emotional aspect to the music is indeed the fulcrum on which everything else is centered and the degree to which the band succeeds is largely dependent on Luca Micioni. He is a singer who can blend in with whatever is going on without necessarily changing what he’s doing at the same time. It’s strange to say but Micioni sounds like a mix of Tobias Sammet, Piotr Wawrzeniuk, and surprisingly enough, Warrel Dane. These comparisons mostly only come out in conjunction with melodies that recall their associated bands, such as the first few minutes of “Waiting for a Day of Happiness” and “Limbo,” which have a distinct tinge of bitterness beneath the eerily uplifting tempo of the rhythms, a tone perfectly befitting of Nevermore, to be sure. The first track, “If I Could Go Back,” shows us how appropriate the verse would sound on Sirius B, not excluding Micioni’s similarity to Wawrzeniuk, of course, and even the chorus has a triumphant tone, which would be equally as suitable on Lemuria. 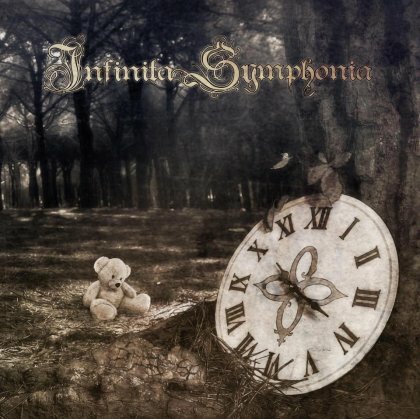 Despite all these similarities, Infinita Symphonia is still very original in their arrangements, managing to combine thrash (“Welcome to My World”) and, rather momentarily, deathcore (“Drowsiness”) for a few fun and unexpected twists for the first spin. It might seem strange, though, amidst the mostly serious and expressive main body that has a proclivity for the soapy and the sappy, but the high quality of songwriting, complete with powerful hooks (“In Your Eyes”) and passionate vocal performance make this record a refreshing breather from its fast-forward and bombastic ilk. This entry was posted in Reviews and tagged Avantasia, Infinita Symphonia, Nevermore, Scarlet Records, Tobias Sammet, Warrel Dane.